* Week 9 saw the return of a formidable Saints' running attack, a dominating effort by the offensive line, and an affirming statement of the Saints' physicality. 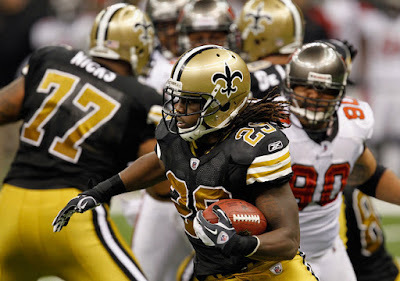 The Saints rolled up 195 yards rushing with an impressive 7.0 yards per carry average. As noted during the TV broadcast, the Saints' offensive line consistently won the battle at the line of scrimmage, repeatedly mashing the Bucs' overmatched defensive line backwards at the line of attack. Utilizing its bevy of backs, the Saints generated quality contributions from Chris Ivory (67 yards), Pierre Thomas (66 yards), and Darren Sproles (42 yards). Brees even chipped in with a 20-yard carry, the second longest of his career. An impressive 80-yard TD drive in the second quarter showcased the diversity of the Saints' RB stable. During the six-play drive, the Saints' RBs pounded the Bucs for 50 yards on three straight carries (Ivory 12, Thomas 33, Ivory 5). Then two plays later, the deadly Darren Sproles caught a screen pass in the right flat and surreptitiously weaved his way for a 21-yard score. * The run defense, the Saints' well-publicized achilles heel throughout this season, answered the bell on Sunday, limiting the Bucs to 84 yards on the ground. This marks just the second time this season the Saints have limited their opponent to fewer than 100 yards rushing (Chicago, 60). In particular, Jonathan Cassilas had a standout performance for the defense, recording 10 tackles. Though only four of these tackles were solo, Cassilas consistently used his speed and quickness to shed blocks and find himself around the ball. At a linebacker position starved for playmakers, Cassilas' recent performance and continued development are a much-needed addition to this defense. Additionally, Roman Harper played a fantastic game recording eight solo tackles (nine total), one sack, and one tackle for loss. For a guy who seems to garner a disproportionate amount of disdain when he plays poorly, Harper has consistently played at a high level in 2011. Yesterday's game might have been his best of the season, and aside from Will Smith and Jabari Greer, Harper is the Saints' best defender. * Speaking of Jabari Greer, he quietly continues to perform as an elite CB. Greer recorded six tackles (five solo), one pass defended, and one tackle for loss. Greer's consistency, high level of play, and relative lack of attention outside of the New Orleans' area are reminiscent of another under-recognized, top player on the roster, Marques Colston. Early in the 4th quarter, Greer made consecutive key defensive stops to force a Bucs' FG inside the Saints' ten yard line. On 2nd and goal from the seven, the Bucs ran a well-designed QB run to the right but Greer quickly diagnosed the play and made an excellent open-field tackle on Josh Freeman for no gain. Then on 3rd and goal, Greer broke up a pass in the back of the end zone intended for Mike Williams. Greer's skill set is exceptionally well-rounded as he has proven equally adept in man coverage, zone schemes, and run support. Further, Greer's continued mentorship of second-year CB Patrick Robinson is a significant contribution as the Saints' secondary continues to play, mostly, at a worthy level. Finally, I'd be remiss not to mention the Saints' excellent 3rd down defense. The Saints' limited the Bucs to just two conversions on twelve attempts. This is an important area for the Saints' defense and they've been mostly good in this area all season. On the year, the Saints' defense ranks 11th in overall third down conversions allowed per game, and 12th in third down conversion percentage allowed per game. Coupled with the Saints' offensive excellence on third down, the defense's third down contributions will play a pivotal role in the Saints' fate in 2011. * On the day, I counted four blown coverages on defense. Near the end of the first quarter, Scott Shanle and Leigh Torrence bungled coverage assignments on 3rd and 10 when Tampa was backed up to their 20 yard line. As a result, Preston Parker caught a pass for 36 yards and was eventually tracked down by Torrence. Then just three plays later on a 2nd and 23, the Saints surrendered a 16-yard catch to Aurellius Benn when neither Shanle nor Greer covered Benn on the play. Luckily, a Tampa penalty on 3rd and 7 prevented the Bucs from turning these two busted coverages into points. At around the three-minute mark of the second quarter, Leigh Torrence was again involved in what was either a blown assignment or just poor coverage. On 1st and 10 from the Bucs' 25, Dezmon Briscoe found himself wide open down the right sideline for a 46-yard gain, the Bucs' longest of the day. This big play led to a Tampa FG just prior to the end of the first half. Lastly, early in the 4th quarter on a 4th and 3 inside the Saints' red zone, Preston Parker went uncovered on a key play that resulted in a first down and kept the Bucs hopes alive. Malcolm Jenkins clumsily interfered with Parker on the play, as he hurriedly rushed to cover the wide-open Parker. I'm not sure whether these continued gaffes were the result of scheme (blitzes) or missed assignments but they were too frequent, giving the Bucs their two biggest plays of the day. * The Saints' pass rush continues to be largely non-existent. Though Cameron Jordan played well and flashed signs of his first-round talent, the Saints front-seven was mostly unable to get to Josh Freeman. The team recorded just one sack, and that was from strong safety Roman Harper. Of the three QB hits on Freeman, only one came from the defensive line (Jordan). That the Saints seem to blitz so frequently, yet sack or hit the opposing QB so infrequently, is mildly concerning (and annoying). If the Saints intend on competing in the postseason against elite passing offenses, they are going to have to generate some semblance of a pass rush from their front four. * Though I really don't want to be "that guy" who complains about the referees, let's just say the officiating could have been a bit better yesterday. And I'll just leave it at that. * Tracy Porter's injury was a scary sight for Saints' and NFL fans alike. Porter made an excellent hit on the game's second play, stumbled to get up, and then lay on the turf for several minutes. After being removed from the field and immobilized on a stretcher, Porter went to the hospital for tests on his head and neck. Thankfully, Porter checked out fine. Get better, TP. The Saints need you for a playoff run.